In these Messenger Lectures, originally delivered at Cornell University and recorded for television by the BBC, Richard Feynman offers an overview of selected physical laws and gathers their common features into one broad principle of invariance. He maintains at the outset that the importance of a physical law is not “how clever we are to have found it out but…how clever nature is to pay attention to it” and steers his discussions toward a final exposition of the elegance and simplicity of all scientific laws. Rather than an essay on the most significant achievements in modern science, The Character of Physical Law is a statement of what is most remarkable in nature. 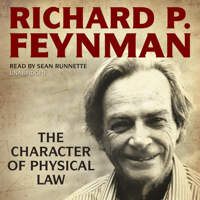 Feynman’s enlightened approach, his wit, and his enthusiasm make this a memorable exposition of the scientist’s craft. The law of gravitation is the author’s principal example. Relating the details of its discovery and stressing its mathematical character, he uses it to demonstrate the essential interaction of mathematics and physics. He views mathematics as the key to any system of scientific laws, suggesting that if it were possible to fill out the structure of scientific theory completely, the result would be an integrated set of mathematical axioms. The principles of conservation, symmetry, and time irreversibility are then considered in relation to developments in classical and modern physics, and in his final lecture, Feynman develops his own analysis of the process and future of scientific discovery. Like any set of oral reflections, The Character of Physical Law has special value as a demonstration of the mind in action. The reader is particularly lucky in Richard Feynman—one of the most eminent and imaginative modern physicists.